Rilastil Progression Nourishing Cream is an antiwrinkle treatment, that fills and acts against deep wrinkles, making the skin look tonic and compact. 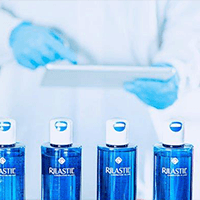 Rilastil Progression is the product line to act against skin aging caused by lack of estrogens, that contrasts and reduces the deep wrinkles (actinic wrinkles). Rilastil Progression Nourishing Cream is an antiwrinkle treatment, that fills and acts against deep wrinkles, making the skin look tonic and compact. Its very rich and creamy formula nourishes deeply, leaving your skin soft and velvety. INGREDIENTS: Aqua (Water) • PEG-8 Beeswax • PEG-6 Stearate • Glycerin • Helianthus annuus (Sunflower) Seed Oil • Ethylhexyl Palmitate • C12-15 Alkyl Benzoate • Butyrospermum parkii (Shea) Butter • Triticum vulgare (Wheat) Germ Oil • Simmondsia chinensis (Jojoba) Seed Oil • PEG-32 Stearate • Glycol Stearate • Octyldodecanol • Sodium PCA • Panthenol • Triisostearin PEG-6 Esters • Hydrolyzed Wheat Protein • Sodium Hyaluronate • Faex (Yeast) Extract• Hydrogenated Coco-glycerides • Ethyl Linolenate • Ethyl Oleate • Ethyl Linoleate • Tocopheryl Acetate • Helianthus annuus (Sunflower) Seed Extract • Hydrogenated Lecithin • Arginine • Dimethicone • Coumarin • Mannitol • Tocopherol • Carbomer • Glycine soja (Soybean) Oil • Hydroxycitronellal • Imidazolidinyl Urea • Hexyl Cinnamal • Methylparaben • Isoeugenol • Alpha-Isomethyl Ionone • Benzyl Salicylate • Propylparaben • Disodium EDTA • BHA • BHT • Linalool • Parfum (Fragrance).